Why wait until the 55th Reunion? Buy one or more license plate frames now - this may be the last time they will be available. 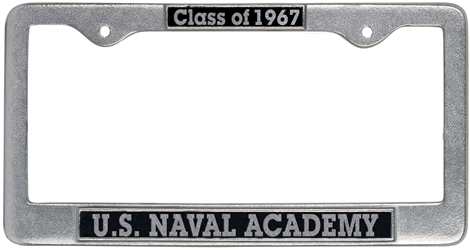 PLEASE NOTE:There are a limited number of license plate frames left in inventory. They will be sold on a "First come, first served" basis. This shirt is made of 100% polyester. 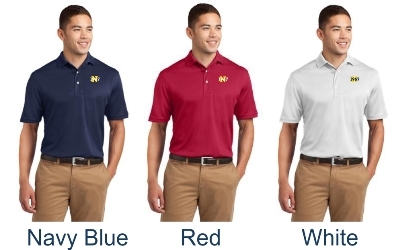 It is Dri-Mesh material, designed to wick away moisture with ease. This shirt is available in navy blue, red, and white. 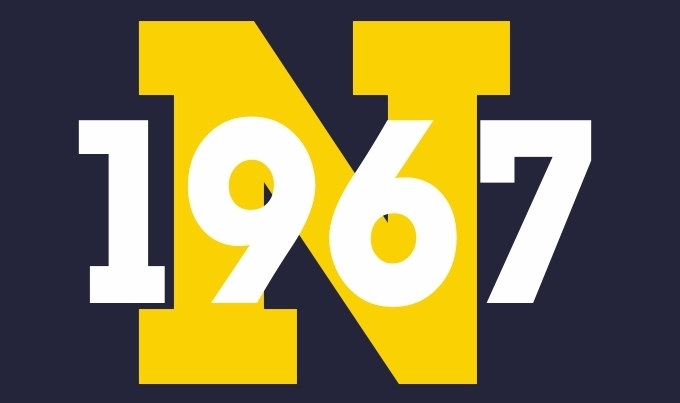 The new N 1967 logo is embroidered on the left chest. 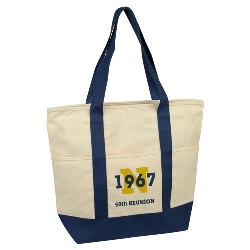 The 50th Reunion Tote Bag is made of 13 oz. cotton canvas. It is 18" H x 15 3/4" W x 6" D.
It has a zip top, a zip interior pocket, and an outside pocket. PLEASE NOTE: There is a limited number of these bags left in inventory. They will be sold on a "First come, first served" basis. This 50th Anniversary Book is a very good record of the Class of 1967 over the past 50 years. There are biographies from more than 800 of our classmates and very informative and entertaining articles on the history of the class and our classmates. Also included are as many pictures as could be collected from members of the class. Select the Ship To Country before entering your order.The prices shown include shipping to the Ship To Country selected. If your Ship To Country is not included in the drop down list of countries, the costs for your overseas shipping will be calculated and added separately to the cost of the book. Your credit card will be charged $50.00 plus the additional cost for overseas shipping.You will be notified about the shipping charges before your credit card is charged for the order. NOTE: There is a limited number of these books available in inventory. They will be sold on a "First come, first served" basis.